Imagine being able to visit your local archives from your couch. Or have unmediated access to 18th century manuscripts half the world away. Virtual reality (VR) technology has incredibly exciting possibilities for archives. The technology allows humans to explore beyond their grasp, to immerse themselves in different environments. Although it may not be as exhilarating as hurtling down a VR slide, there are really exciting opportunities for archives to simulate the reference experience to enable patrons to “physically” explore their holdings. Nothing will ever substitute that feeling of touching a piece of the past, but what if the records have been lost or the archives destroyed? How can we reconnect with a past that has been lost? Beyond 2022 is one of the most ambitious projects I have ever come across and it offers a glimpse of how virtual reality technology could be incredibly useful for archives in the future. 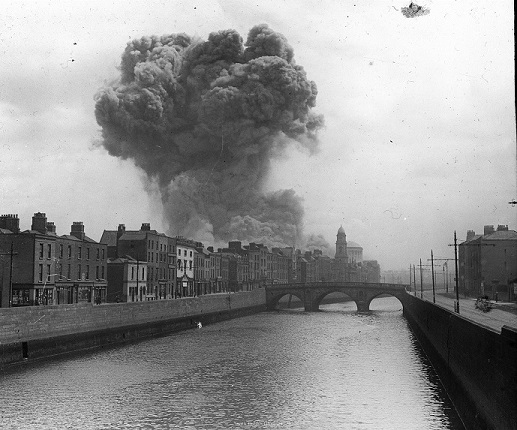 On June 30, 1922 mines exploded in the basement of the Public Records Office in Ireland, destroying the building and the entirety of the records contained within it that documented Irish administration from the 13th to 19th century. The loss included census records, wills, and parish registers that recorded baptisms, marriages, and burials. It was devastating for the country and has resulted in a kind of historical amnesia. For more info on the event, see this article in the Irish Times. With the hundredth anniversary of the event looming, Trinity College Dublin is collaborating with the National Archives (Ireland), the National Archives (UK), the Public Record Office of Northern Ireland, and the Irish Manuscripts Commission, with funding from the Irish Research Council. “Experience what it would have been like to wander through the archive. The public will be able to explore the archive, go to a shelf where they know a record is stored, identify that record on the shelf…” It just gives me chills. The vast network of partners involved in this project is inspiring. I am also blown away by the fact that plans survive that detail, down to the shelf location, how the Public Records Office was organized at the time of its destruction. This will enable the project partners to create an authentic virtual experience for patrons. Creating an immersive virtual reality environment is a phenomenally ambitious undertaking and I cannot wait to see the results. For more information, and for a preview of the reconstruction, visit Beyond2022. As part of the celebrations of the Olympic Games in Rio back in 2016, the New York Times mined their photographic archives for a virtual reality film experience called “The Modern Games.” By downloading the New York Times VR App, users can “travel through time to some of the most unforgettable moments in Olympic history.” The project “transformed archival imagery into historical settings” that can be visited by viewers. I love that projects like this help to raise awareness of the treasure trove of historical records that exist. I would love to see an archives explore this kind of partnership to bring their holdings to life. For more information, or to download the app, visit this site. Could the future of access be completely virtual? There seem to be many examples of archival records being used to animate VR experiences, but Beyond 2022 is the only project I have found that uses virtual reality technology to actually simulate the experience of consulting records in an archives. Imagine the possibilities of motion capture and haptic feedback (e.g. the Teslasuit) for discovering archival records in virtual reality. This technology could completely change how we think about providing access. I would love to hear about other virtual reality projects being undertaken by archives – drop me a line if you know of any.